Racing in India is something of a surprise packet, not to mention the only sport on which gambling is legally allowed in the country. It is restricted to Indian-bred horses but imported and shuttle stallions from around the world have ensured a strong pool of horses for racing. Wagering on racing in India is done through licensed bookmakers as well as pari-mutuel pools, while it is also widely believed there are many unlicensed (read illegal) bookmakers operating on the races. Take-out rates in the totalisator (pari-mutuel) pools can be restrictive for the serious gambler, as they are in many parts of the world, but there are plenty of fixed-price options for this who want to bet racing in this wonderfully diverse nation. In the off-season in their home jurisdictions, many of the world’s best overseas jockeys have also tried their hand on the Indian turf, and dirt. The likes of Richard Hughes, Stephane Pasquier, Martin Dwyer, Colm O’Donoghue and Joseph O’Brien have “wintered” in the subcontinent. Past greats such as Lester Piggott, Johnny Murtagh and Mick Kinane have also had stints there. Chalk up Indian thoroughbred racing as another one for the British military. As with many other racing regions around the world, India’s racing industry had its organised beginnings as a leisure pursuit among the cavalry-based army. As the control of the British spread, so too did horse racing as almost every cantonment had a horse racing track among other equine pursuits such as polo, fox hunting and point-to-point racing. Calcutta was the seat of British power and the headquarters from which racing spread. The Madras Race Club was the first official organisation, founded in 1778 with the racetrack there believed to be opened a year earlier. That predates evens the English Derby! It is estimated that by the mid 1800s, there were 100 racecourses in the country. The horses had started out as a mix of cavalry horses, imported chargers and Arabians and the races were largely run over staying distances. But as the sport grew so did the importation of better bloodlines from around the world. By 1900, the Indian population was starting to take a much greater interest and role in the industry. Also, two prominent racing figures in Britain, Victor Sassoon and the Aga Khan, took an interest in Indian racing and brought with them strong bloodlines from their overseas operations. By the 1930s the control of racing fell under the auspices of two ruling bodies: the Royal Western India Turf Club and the Royal Calcutta Turf Club. And a significant milestone came in 1942-43 with introduction of the Indian Classic races: the India Derby, the 1000 Guineas and the 2000 Guineas. Further classics the Oaks and St Leger were introduced a year later. All of these were restricted to horses bred in India. With the exit of the British soon after, racing ceased at many of the army camp tracks and began to be focused into the main cities. The RWITC took charge of racing in Bombay, Pune and Delhi; Royal Calcutta Turf Club remained in charge of racing in Calcutta; the South India Turf Club held the reins for Madras, Ootacamund, Mysore, Bangalore and Hyderabad. Later shake-ups resulted in the Madras Race Club taking control of racing in Madras and Ootacamund, or Ooty as it is commonly known; the Bangalore Turf Club running racing at Bangalore and Mysore; and Hyderabad Race Club overseeing its own operations. In India you can choose to bet via on-course bookmakers or via the pari-mutuel (totalisator) system. Most of the usual betting options are available, with the minimum bet set at Rs.10/- at most tracks. Win: Bet on a horse to finish first. Place: Bet on a horse to finish in the top three. Or top two if the field has seven or fewer runners. Accumulator Win: A multi-race bet in which winnings move on to the next selection. One for the more experienced bettor. Accumulator Place: See above except you just need all your selections to run a place. Kenchi: A permutation of the Accumulator Win or Place wager accepted for a chosen group of 3-5 races. Gives you more of a chance than the straight-up accumulator. Forecast (Exacta): Pick two horses to finish first and second. Quinella: Just like the forecast except you don’t need to select the first two in the correct order. Second Horse: Back a horse to come second only. Tanala: In this bet type which is variation on the trifecta and can pay big dividends, you must predict the first three horses in correct order. If you get the winner right, but your second and third choices reverse their places, you win a consolation share of the pool. Racing in India is controlled by six racing authorities with nine tracks in play. Royal Calcutta Turf Club: The club was officially founded in 1847 but long before that Calcutta had been the epicentre of racing in India. At one stage it ran racing on almost all subcontinent courses. It now conducts the racing in Kolkata, with the winter season running November-April and a monsoon season July-October. Races are held mostly on Wednesday and Saturdays. Royal Western India Turf Club: Another of the oldest clubs in India and conducts racing at two tracks: the Mahalaxmi Racecourse in Mumbai (Thursdays, Saturday and Sundays, November-April) and at Pune (Saturdays and Sundays, July-October). The RWITC conducts around 70 meetings per year. 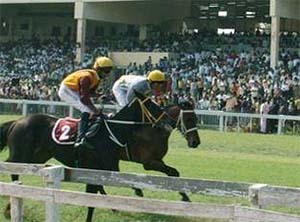 Delhi Race Club: Founded in 1940 and conducts racing in India’s capital. Races are held once a week from August-May. Runs under the rules and authority of the Royal Western India Turf Club (RWITC). Bangalore Turf Club: Was born in 1921 and conducts racing at Bengaluru: a summer season (May-August) and a winter season (November-April). Racing is generally hosted on Fridays and Saturdays. Madras Race Club (Chennai): Home of the oldest course in the country and feature races the South India Derby and South India Oaks. Races are held in Chennai (October-March) in winter and Ooty in summer. Hyderabad Race Club: Conducts racing in Hyderabad on the Monsoon Track (July- October) and the Winter Track (November-February). Races are usually held on Sundays and Mondays. Mysore Race Club: Conducts racing in Mysuru, and the track is among the most picturesque in the country, set in the foothills of the Chamundi Hills. Main season runs from August-October, with shorter summer and winter seasons. India’s five Classics for home-breds are the most sought-after races in the country. They are named for the original British classics, with four of these races – Indian 1000 Guineas, Indian 2000 Guineas, Indian Oaks and Indian Derby – run in India’s biggest city Mumbai, and one, the St Leger, at Pune. The Guineas races are held each December, the Oaks in late January and the Derby on the first Sunday in February. The St Leger is run in September. Another big race on the calendar is the Indian Turf Invitation Cup, which was inaugurated in 1963 and is held on a rotating basis at Mumbai, Kolkata, Chennai, Bangalore and Hyderabad. In the early 80s two more group 1 races were added to the Invitation Cup (2400m): the Sprinters’ Cup (1200m) and the Stayers’ Cup (3000m). Later followed the Super Mile Cup over 1600m. This means that the four races are run on the first weekend each March at one of the five major racing venues with the best horses from around the country invited. In 2019 the races were held at Hyderabad.